This series of short, accessible briefs provides background information on the different issues and topics relating to intellectual property and genetic resources, traditional cultural expressions and traditional knowledge. This Brief introduces intellectual property issues related to genetic resources under discussion in WIPO. This Brief describes the main objectives of documenting traditional knowledge and traditional cultural expressions, the intellectual property issues that may arise and options for addressing them. This Brief introduces how alternative dispute resolution offers an alternative to formal court-based systems for tackling intellectual property disputes that may arise in relation to traditional knowledge, traditional cultural expressions and genetic resources. This Brief explores the issues concerning customary law, traditional knowledge and intellectual property. This Brief introduces different options on intellectual property protection of traditional medical knowledge. This Brief identifies practical, accessible and often community-based means of using the existing intellectual property system for the effective recognition, protection, management, marketing and commercialization of traditional handicrafts. This Brief introduces intellectual property consideration for arts festival organizers, to safeguard and promote their own interests and those of festival participants. This Brief summarizes the legal, policy and operational issues that need to be considered in developing a national strategy for the intellectual property protection of traditional knowledge and traditional cultural expressions. This Brief provides background information on the WIPO Intergovernmental Committee on Intellectual Property and Genetic Resources, Traditional Knowledge and Folklore (IGC). 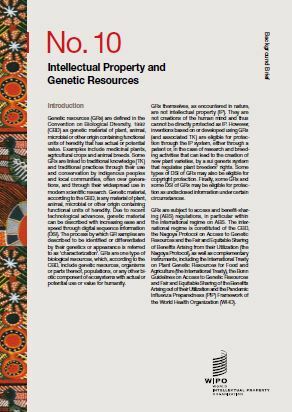 This Brief provides general and basic information on the interface between intellectual property and traditional knowledge, traditional cultural expressions, and genetic resources.